Alaska’s Denali (6,194 m) – still known as Mount McKinley in official USA government circles – has a set of unique characteristics that are known far and wide across the mountaineering world. The low altitude (~700 m) from which it rises, just 3° south of the 66°6’N latitude Arctic Circle, gives it a singular distinction amongst the world’s mountains. Denali’s closest 6,000 m rival in terms of latitude is in central Asia, at just 39°N. 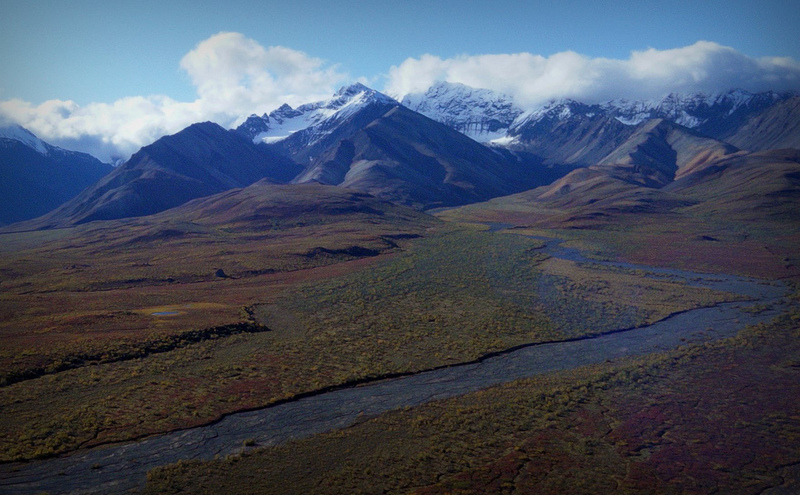 This ensures that Denali is not only the coldest of the 6,000m mountains, but is vulnerable to the violent storms that head south from the Arctic and gather in the nearby Gulf of Alaska and Bering Sea. 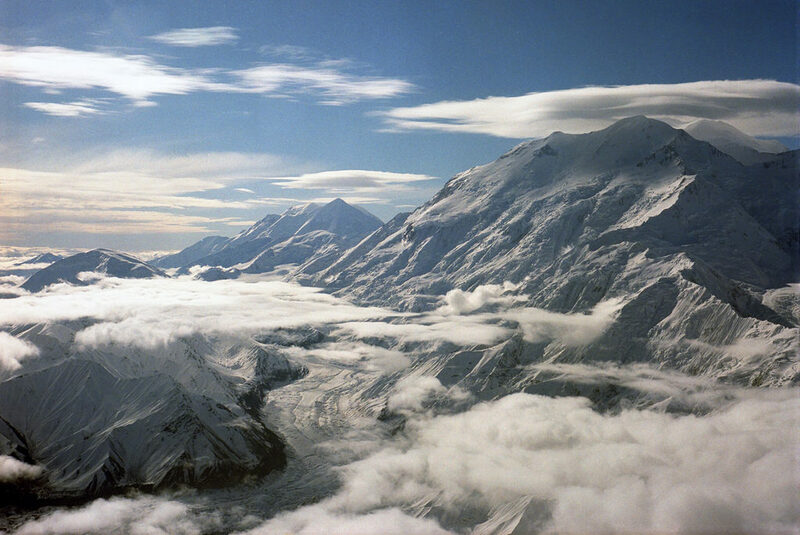 The vast majority of climbers access Denali via single-engine aircraft fitted with skis from the Alaskan town of Talkeetna – a 40 minute flight away. Alternatively it is possible to walk directly to the mountain. However, expect to spend at least five days walking with huge loads across mosquito-infested tundra and large glacial river crossings before you reach the mountain! The Alaskan adage of “fly an hour or walk a week” certainly applies here. Talkeetna is a 2.5 hour drive north of Anchorage. See US National Park Service website for available aviation services and Anchorage to Talkeetna shuttles. Those who prefer train travel may also ride the Alaska Railroad from Anchorage to Talkeetna. However times are not always convenient and it can cost considerably more than a shuttle. 1) Pack heavy items on the bottom, lighter items on top. Use one or more duffel bags that are securely attached to the sled with accessory cord. 2) Do not put all food, fuel, tents or other group gear in one sled – divide such items among the group. If a sledge is lost down a crevasse, your expedition will come to a very premature end if you haven’t divided up your gear. 3) It is recommended that a least the lead person on a rope team hitches their sled to the climbing rope behind them – this may prevent the sledge from dropping on top of you in the event of a crevasse fall. Managing both a sledge and backpack, whilst wearing skis or snowshoes and being roped together, takes a bit of getting used to! However, you will get plenty of practice, since it’s best to travel in roped, glacier-travel mode as far as Basin Camp at 4,300m. At this point the sledges can be cached until your descent. Whilst the crevasse danger lessens above this point, most parties elect to stay roped together for the duration of the climb. Camp 1 is established at 2,375 m at the confluence of the main Kahiltna Glacier and the heavily crevassed Northeast Fork (3-6 hours from the Kahiltna Glacier airstrip). Many climbers start to “ferry” loads between camps at this point so as to reduce the weight they are moving at one go. Importantly, this process also slows down the rate of ascent and allows for a more gradual acclimatization to the altitude. In addition, the repeated load carries are especially enjoyable for those wearing skis! The downhill skiing is especially good between Camp 1, the Camp at Kahiltna Pass (2,950 m) (climb from Camp 1 to Kahiltna Pass is 2-5 hours) and Motorcycle Hill Camp (3,350 m) (climb from Kahiltna Pass to Motorcycle Hill Camp is 2-4 hours). Downhill skiing while roped up is difficult, but is highly recommended in heavily crevassed areas! Above Motorcycle Hill Camp at 3,350 m, the climbing steepens as the route takes you past the terminal walls of the West Buttress. Many will opt to cache skis or snowshoes at 3,350 m and continue the climb with crampons and a single ice axe (with perhaps a ski pole in the other hand for additional support) since the route steepens here and the snowpack hardens. You’ll then have to climb steeply out of a basin in order to reach Windy Corner at 4,115 m, and then make an ascending traverse through seracs and heavily crevassed terrain to approach the head of the Kahiltna Glacier and Basin Camp at ~4,300 m (climb from Motorcycle Hill Camp to Basin Camp is 4-8 hours) . As you look down to the lower Kahiltna Glacier and out to 5,300 m Mt. Foraker the views are spectacular. In the opposite direction the impressive summit bulk of Denali rises above you, and the details of the upper West Rib and Messner Couloir are clear, as is the steep headwall of the West Buttress that you’ll soon be climbing. At Basin Camp (4,300 m), most groups take a rest day, since time is needed to make final preparations for your summit bid and the load carrying that you’ll need to do in order to be ready for high camp and beyond. At this point you’re about to embark upon the most demanding part of the climb – with higher, colder territory combined with steeper and more exposed ground providing a fierce test of skills and stamina. From Basin Camp, you ascend approximately 300 m up a gentle snow slope to the bergschrund at the base of the West Buttress. The bergschrund is at times quite steep but it is short and, with steps established in the ice, not difficult to surmount. The ascent of the West Buttress now begins via the 300 m headwall that lies in front of you. The angle of this slope is 45 to 50-degrees and care needs to be taken. Typically the pitches are hard ice with some overlying snow. It is possible to protect this section with jumars since a fixed rope is placed every season with the assistance of the NPS and local guides. Because of the steepness of the route and the amount of altitude gained, most parties make a double carry to establish Ridge Camp at just over 5,000 m (climb from Basin Camp to Ridge Camp is 2-3 hrs). Emerging from the headwall onto the top of the Buttress, the atmosphere of the climb changes dramatically. The exposure is considerable. As you begin to move along the crest of the Buttress, views spread north across the Peters Glacier to the Alaskan tundra and south to the scores of other peaks in the Alaska Range. These vistas are spectacular in clear weather. Initially the ridge is fairly broad, but gradually it narrows, with steep drop-offs to both sides. The traverse to High Camp (at 5,245 m) follows a steadily narrowing crest and at times moves between and around a series of magnificent, pointed granite gendarmes up to 20 m high. The climbing is never steeper than 35 degrees, but the exposure is significant and requires caution, especially in high winds, as you move up a route that in some sections is reduced to ledges just one or two metres wide. Close to High Camp the ridge finally begins to merge with the main part of the Denali massif, and soon you’ll establish camp in a basin just below Denali Pass, the low point between Denali’s higher south summit and the slightly lower north peak (climb from Ridge Camp to High Camp is 2-5 hours). From here you will climb to the summit in a single day. On summit day you’ll make an ascending traverse to Denali Pass, and en route overcome a fairly steep section between 5,360 and 5,490 m. From there you’ll climb gentle slopes to a plateau at 5,910 m, from which you get impressive views down onto the Harper and Muldrow Glaciers and across to Denali’s North Peak. The final approach to the summit climbs moderately steep slopes to the crest of the ridge between Kahiltna Horn (6,130 m) and the main summit. At the crest you can peer down the 2,400 m drop of the precipitous South Face, looking between the Cassin Ridge to your right and the South Buttress to your left. From here you’ll ascend the summit ridge on its exposed south side, before switching to north side for approximately 200 mostly horizontal meters to the clearly defined 6,194 m summit of the highest mountain in North America. Plan on 8-12 hours from High Camp to the summit. Keep an eye on the weather and abort the climb if bad weather is approaching. You do not want the highlight of your climb to be getting caught in a storm near the top of Denali – it has on many occasions been a deadly experience for those who ignore changing weather high on this peak. Bad weather above 5,000 m on this mountain is a serious proposition. Whiteouts are common and wind chill factors can often be “off the charts”! The time from Kahiltna base to the summit and return is usually accomplished in 14-21 days. The decision when and where to make double carries between camps and take rest days for acclimatization are up to you. However “storm days”, when you are confined to your tent, are beyond your control. Ensure that you have incorporated some extra days into your schedule to allow enough time to sit out a multiple-day storm (or two). Providence Alaska Medical Center and Alaska Regional Hospital in Anchorage both offer full-service, comprehensive care. Basin Camp at 4,330 m is the site of a NPS climbing ranger encampment and is occupied from late April to early July. In addition, there is normally a medically-trained individual working on the rotating ranger patrols that criss cross the mountain throughout the season. This is an emergency “facility” – do not rely on the NPS for first aid supplies and other things which should be a normal part of your expeditionary kit! The NPS Search and Rescue Policy states that rescue operations are conducted on a discretionary basis. There is an expectation that Park users will demonstrate a degree of self reliance and responsibility for their own safety as regards extracting themselves from problems. Helicopters configured for high altitude rescue are used for urgent evacuations, but the nature of the weather, distances involved, and availability of rescue personnel on Denali makes this a different situation than, for instance, rescue in the European Alps. Parties are better off performing self-rescue if at all possible – one is better off realizing straightaway that Denali is not a place to expect the sort of “rapid response” rescue service routinely seen in Zermatt or Chamonix! The standard climbing season is late April through early July. However even in late April it can still be very cold – normal night time temperatures at 4330 m in April are minus 30 or 40 C. Those who climb prior to early May should be prepared for winter-like temperatures and minus 50 C (or less) on the upper mountain. As a general rule, the springtime is typically clear and cold – but windy – with Arctic air masses predominating, and as summer approaches a moist southerly air flow from the Gulf of Alaska takes over. The majority of climbers elect to come to Denali at the time of the seasonal shift (late May to early June) where hopefully they’ll get both clear weather and mild temperatures. It is certainly possible to climb after early July, but the aviation companies usually begin to limit flights to the Kahiltna Glacier at that time since open crevasses start to appear on the runway! If you think you might enjoy walking a week or more in to the climb or out to civilization through mosquito infested tundra and across big glacial rivers – not to mention dodging Grizzly bears – climbing in the latter part of the season has its advantages. The temperatures are often warmer and you’ll benefit from the 20+ hours of sub-arctic summer daylight. CB radios are widely used on Denali, and both the NPS and the Base Camp Manager on the Kahiltna Glacier monitor channel 19. These radios normally rely on line-of-sight, however. Mobile phones often work well at Basin Camp and above, provided your phone service provider has a roaming agreement with an Alaskan telecom company. Satellite phones are another option, but only Iridium has reception – Thuraya does not work on Denali. As already suggested, Denali can be a very cold place. However, below approximately 3000 m on the mountain later in the season, it can get very warm. At midday it can feel like you’re trapped in a solar oven! As summer nears, parties below 3000m often choose to travel at night . Although it is much cooler, it is rarely too cold and there is often sufficient light by which to travel. Because of factors such as the tremendous vertical relief of Denali, high latitude, and closeness of the ocean, mountain storms here are legendary. Be prepared to be hit by a couple of storms during the course of the climb. If you are lucky, they may be mild and last only 24 hours or so. However a severe 5-7 day pounding from a single storm system is not unheard of by any means. Be prepared. The West Buttress is technically straightforward. Nevertheless, you’ll need to be familiar with roped glacial travel, exposed ridge walking and climbing short, steep sections of 40-50 degree snow and ice. The steepest sections of the route, between Basin Camp and Ridge Camp, are protected by fixed ropes. The use of a jumar or other type of ascender is recommended. At times you’ll feel that the real difficulty of the route is to be found in shifting your kit up and down the mountain. Unfortunately, heavy packs and sledges are the order of the day. The majority of the danger on Denali stems from the high altitude and sub-arctic environment. The incidence of high altitude illness on the mountain is exacerbated by the physiological stress of the hard work needed to haul heavy loads in a very cold environment. Allow sufficient time for acclimatization and enough storm days so that you don’t have to rush your ascent. The cold, especially early in the season, can be so intense that frostbite is an ever-present danger. Other routine mountain-related hazards such as falls and avalanches must also be considered, but altitude illness and frostbite are by far the most commonly encountered problems for climbers. For advice on high altitude illness, see our Medcom papers. Ensure that you’re kitted out with the best clothing and equipment possible. Prevention is the key to avoiding injuries from the cold! Keep well hydrated and don’t skip meals. Weight loss and dehydration will make you more vulnerable to the effects of the cold. Take time to stop and warm numb areas of skin. In the coldest conditions frostbite can strike in seconds. Keep feet and hands dry at all times. Frostbite is much more common in damp conditions. Rewarm frostbite as soon as the chance of refreezing has passed. Repeated frostbite will result in extensive injuries. To warm the skin, do not rub, beat or cover with snow. Protect blisters, abrasions and sunburn. These are much more likely to become frostbitten than “normal” skin. The NPS mountaineering booklet is a highly recommended reference, and it is available in several languages. There has also been a considerable amount of literature published on climbing (and surviving) Denali, and many relevant titles are listed in the bibliography section of this NPS booklet. Going to this mountain well-informed and prepared for whatever the high, sub-arctic environment might throw at you is most certainly worth the investment of your time and effort! Hallam MJ, Cubison T, Dheansa B, Imray CH. Managing frostbite. BMJ 2010;341:e5864. McIntosh SE, Campbell AD, Dow J, Grissom CK. Mountaineering fatalities on Denali. High Altitude Medicine and Biology 2008;9:89-95. McIntosh, S., McDevitt, M., Rodway, G., Dow, J., Grisson, C. Phenotypic, Geographic, and Expedition Determinants of Reaching the Summit of Denali. High Altitude Medicine and Biology 2010;11:223-229. Acknowledgements: The authors wish to thank David Hillebrandt and Buddha Basnyat for their help in the preparation of this article.